Lenovo this week introduced its 7th Generation ThinkPad X1 Carbon laptops. The new notebooks got a number of tangible improvements when compared to their predecessors. The latest ThinkPad X1 Carbon come in a thinner chassis and integrate latest-gen processors from Intel. In addition, higher-end versions of the new ThinkPad X1 Carbon will come equipped with a 4K LCD featuring a 500 nits brightness and Dolby Vision HDR support. 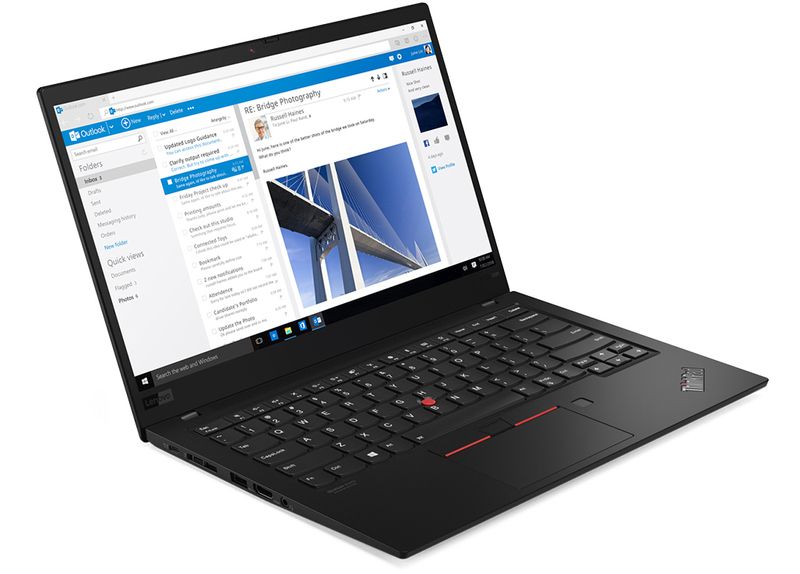 Being Lenovo’s flagship notebooks, ThinkPad X1 Carbon support the company’s latest technologies and business features as the manufacturer naturally wants to create a product that will stand out from the crowd. The new ThinkPad X1 Carbon comes in a new chassis that is 14.95 mm thick (down from 15.95 mm before) and weighs 1.08 kilograms (down from 1.13 kilograms before). Traditionally, ThinkPad X1 Carbon features ultra-thin display bezels that enable to install a 14-inch LCD into 13.3-inch-class chassis. Speaking of monitors, it is necessary to note that the new laptops will be outfitted either with a premium 10-bit Ultra-HD display panel with a 500 nits brightness and Dolby Vision HDR support, or a more conservative Full-HD panel with a 400 nits brightness and the ThinkPad Privacy Guard. The new ThinkPad X1 Carbon laptops are based on Intel’s quad-core 8th Gen Core i5/i7 processors based on the Whiskey Lake microarchitecture and featuring Intel’s UHD Graphics 620 iGPU. Just like in case of previous-gen ThinkPad X1 Carbon machines, the CPU will be paired with LPDDR3 (presumably) DRAM, and a PCIe SSD. Since the laptop is about half of a year away, Lenovo does not disclose its exact specifications, possibly because some things may change. Connectivity wise, the 7th Gen ThinkPad X1 Carbon seems to be generally similar to its predecessor albeit with some improvements: it is going to support Wi-Fi + Bluetooth featuring an enhanced antenna design, an optional 4G/LTE-A Cat16 modem, two Thunderbolt 3 ports, USB 3.0 Type-A connectors, a GbE with a dongle, an HDMI output, a TRRS audio connector, and so on. One of the important improvements of the upcoming ThinkPad X1 Carbon laptops over the current-gen laptop is a revamped Dolby Atmos-badged audio subsystem with four speakers and four far-field microphones. As for webcam, Lenovo will offer both regular as well as IR-equipped 720p cameras both of which can now be covered with the company’s ThinkShutter privacy cover. Lenovo says that its next-gen Lenovo ThinkPad X1 Carbon notebooks will work for up to 15 hours, but does not mention its exact capacity. Based on previous-gen flagship Lenovo laptops, it is highly likely that only Full-HD model will operate for up to 15 hours on one charge, whereas Ultra-HD SKUs will work for around 12 hours, depending on the usage model. The 7th Generation Lenovo ThinkPad X1 Carbon laptops will not be available for quite a while. Lenovo promises to start their sales only in June, 2019, at an MSRP starting from $1709.